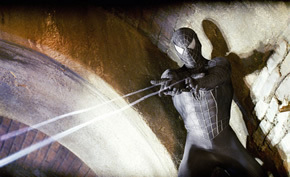 Publicity Still of "Spider-man 3"
(Sony Pictures Entertainment © 2007 Columbia Pictures Industries, Inc. All Rights Reserved. The lead single, “Signal Fire,” from multi-platinum UK artist Snow Patrol – which is already impacting Modern Rock, Hot AC, and Top 40 radio – kicks off the "Spider-Man 3" soundtrack! In "Spider-Man 3," based on the legendary Marvel Comics series, Peter Parker has finally managed to strike a balance between his devotion to M.J. and his duties as a superhero. But there is a storm brewing on the horizon. When his suit suddenly changes, turning jet-black and enhancing his powers, it transforms Peter as well, bringing out the dark, vengeful side of his personality that he is struggling to control. 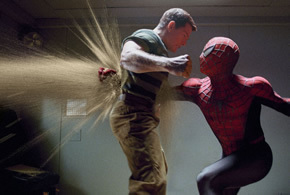 Under the influence of the suit, Peter becomes overconfident and starts to neglect the people who care about him most. Forced to choose between the seductive power of the new suit and the compassionate hero he used to be, Peter must overcome his personal demons as two of the most-feared villains yet, Sandman and Venom, gather unparalleled power and a thirst for retribution to threaten Peter and everyone he loves. 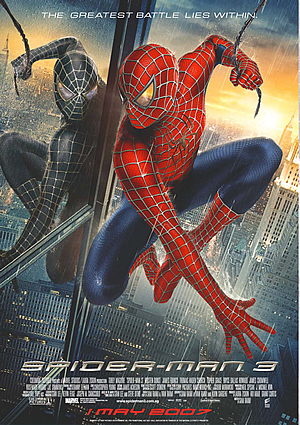 Spider-man 3 marks the commencement of the 2007 Summer Blockbusters Invasion. Director Sam Raimi and company are making sure that they packed so much more into this movie to exceed the previous installment of the Spider-man franchise and perhaps set such a high standard to challenge the other Summer Blockbusters to stay on par with what they got to offer. There a lot of events going on in Spider-man 3, new villains, new costume, new twist in Uncle Ben’s Death, new woes in Peter Parker and Mary Jane’s love relationship and so much more that we better start this review asap. Let’s start with the positive bits of Spider-man 3. After going through so many trials and tribulations, just when it seems that nothing could rock the relationship between Mary Jane (Kirsten Dunst) and Peter Parker (Tobey Maguire), the storytellers threw another obstacle in their way and it was rather effective. A classic scenario of when one partner is more successful than the other and is oblivious to the other woes was quite a fresh set of problems. In a way, this new set of problem was the heart of this movie that help carry all the other plot devices till the end of the movie. With the build up from the previous 2 movies, James Franco gave the best rendition of Harry Osborn / the new Green Goblin yet. His character call for more complexity than the whiny and clueless Harry Osborn that he had played and James Franco was more than capable to provide some depth as a very conflicted villain who out to revenge his father death. In comparison to his co star Tobey Maguire’s struggle with the dark side also in this movie, James Franco seems more adept and creditable in balancing the good and evil persona. Following the traditions of the three movies, the cameo appearances of Stan Lee (the creator of Spider-man) and Bruce Campbell (frequent collaborator with Director Sam Raimi) were once again a rare treat for the fans. Comic fans will get a kick when Stan Lee appears to deliver an inspirational “nuff said” dialogue to Peter Parker while Bruce Campbell will bring the house down with laughter as a restaurant captain. Tradition aside, the new inclusion of Sandman (a second rate villain in Spider-man world) as the latest villain didn’t felt like a good idea initially and linking it up with the murder of Uncle Ben was just too much a stretch after the murder took place two movies and so many years ago. But as the manner that Doc Octopus was handled in the second Spider-man movie, the Sandman character was spruced up and suddenly became more intriguing and more terrifying. The creation of Sandman in the comics felt contrived and yet in this movie, with the special effects showcasing the sand formation of Sandman that was so impressive and with fine acting from Thomas Haden Church, the origin story of Sandman became more endearing and believable. Even the tie-in with the murder of Uncle Ben had a unique sensibility of remorse and sadness that made the whole fiasco more relatable and less far fetch. Venom on the other hand, felt that it had short-changed the audience of it’s potential. Venom being the most anticipated character in Spider-man’s rogue gallery, had fans clamoring for his appearance ever since the first movie. There were conflicting reports that stated that Director Sam Raimi didn’t liked Venom and wasn’t going to use it but there were also reports that it was a smoke screen to keep the fans excited. Nevertheless, just before the contracts expired for the leads (Tobey Maguire and Kirsten Dunst) and in what might possibly be the last Spider-man movie, Venom was squeezed into the third Spider-man movie which is already packed with more than it’s fair share of villains. So what went wrong for the first theatrical appearance of Venom? The first and greatest difference was that the movie robbed away the fearsomeness of Venom from the comics. In the comics realm (particularly in the first story arc that details their first encounter), readers literally feel the fears and anguish for Spider-man as Venom was able to outdo every super abilities that Spider-man has and since it was a once a symbiote that was attached to Spider-man, Spider-man’s sensitive spider-sense were unable to detect any assaults from Venom, thus making Venom the biggest and meanest villain in Spider-man rogue gallery. However, there wasn’t any opportunity to showcase that fearsomeness of Venom unless this movie exceeds the three hours mark. In summary, the Venom from the printed material source could wrack so much havoc in Spider-man’s life by himself that he hardly requires any assistance at all but that not the case for the movie version of Venom which once again took another big bite off Venom’s unique origin. Another moot point was the portrayal of Venom alter ego, Eddie Brock performed by Topher Grace. Both version of Eddie Brock had him going into a psychotic personal vengeance against Spider-man, but the route down the psychotic path differs and the comic’s version felt so much more satisfying than the movie version. While the comic’s version build Eddie Brock as a more morally upright character that was driven to madness when Spider-man/ Peter Parker inadvertently exposed his mistake in a newspaper article, the movie version had Topher Grace as a lowlife who resorted to underhanded methods that made it hard to relate his personal vendetta against Spider-man. Both of the weakness stated above could easily point to the very obvious fact that there was simply not enough time in this movie to squeeze a major character such as Venom into this movie. A complex character like Venom would require at least 2 movies to tell, one to introduce Eddie Brock’s downfall and another to showcase the mayhem that only Venom could dish to Spider-man. For casual viewers who are unaware of the rich history that Venom got, they could be easily razzle dazzle by the special computer generated effects on the symbiote and the modified tale of Venom but fans of the comic origin (specially the first story arc) will likely be disappointed with how Venom was handled. And it’s not just the Venom character that was not handled well, any storyline in this movie that has link with the alien symbiote just felt out of the pace with the rest of the storylines that were going on. Starting for the absurd introduction of the alien symbiote which fell from the skies and against all probabilities, landed near a certain superhero, to the very silly portrayal of Peter Parker’s transgression caused by the symbiote’s presence made it all felt like it was just rushing to get the story told. For the casual viewers who are not that in touch with the comic’s roots of these few characters, it’s easy to sit back and enjoy this flick as a mindless blockbuster entertainment. But if you are a fan of how characters were slowly build up in the previous installments of Spider-man movies or have some knowledge of the potential of Venom, you might be disappointed with the overall direction this movie took to pack too many characters and events into one movie.